September is a absolutely fantastic month for playing golf. The sun is shining and yet it is not too hot. The kind of days that an avid golfer expects when playing 9 hole, 18 hole or if you’re just driving the balls as far as you can at the driving range. Sadly we sometimes have turbulent weather in September. However, on the good days, when the sun is shining,there is no better time than now for playing golf for many of you out there. I bet you didn’t know this but Santa Claus likes to play golf himself. In fact, he has his own 18 hole golf course and driving range up at the North Pole‎. He gets a lot of practice. However as jolly as he is, he would not share his golf score with us. We are however, lucky enough to be able provide you with a LED Lighted Outdoor Santa Claus Playing Golf Decoration. Every golf course in the country should take notice because this LED Lighted Santa Claus Playing Golf Decoration will certainly be an attractive addition to an existing display or it can stand alone. 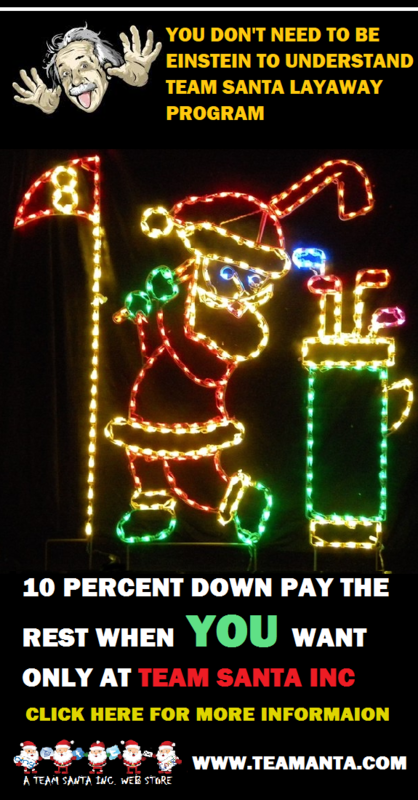 Put Santa golfing at the entrance to the country club or golf club.‎ Those of you who live on golf courses, this is a no brainer. How cool would it look to have several of this decoration(s) set up in an area on the golf course. At night it will look like the Santa’s are playing golf. It is really a very cool lighted decoration. I will see you again tomorrow. Please be sure to check back or get on our email list so you get all the exclusive offers. If you have questions, comments, etc. please send an email to support@teamsanta.com and we will get back to you promptly. You may also call toll free 888-770-7372. Let me tell you why “back to school” reminds me of “small Christmas trees. While most college students will go home for the holidays, there are always some students left behind. I was one of those students who spent the holidays at my dorm room. When I went to college, I missed two Christmas holidays seasons with my mom and dad and the rest of my family. We decorated the dorm room the best we could. We would decorate with make shift decorations that we made ourselves. Boy it was fun bank then. However, I am now here to tell you that there is no reason not to have a Christmas tree at your dorm room this coming holiday season. Even in dorm rooms with limited space. For those students who are really cramped for space, please allow me to recommend a small table top pre-lighted artificial Christmas tree. This small Christmas tree does not take up much room at all. Additionally, because it has LED Christmas lights, it uses a minimal amount of energy and the bulbs never ever get hot. These lovely Christmas trees look adorable in a dorm room or in any collegiate area. Now, sometimes, you have absolutely have no room at all. 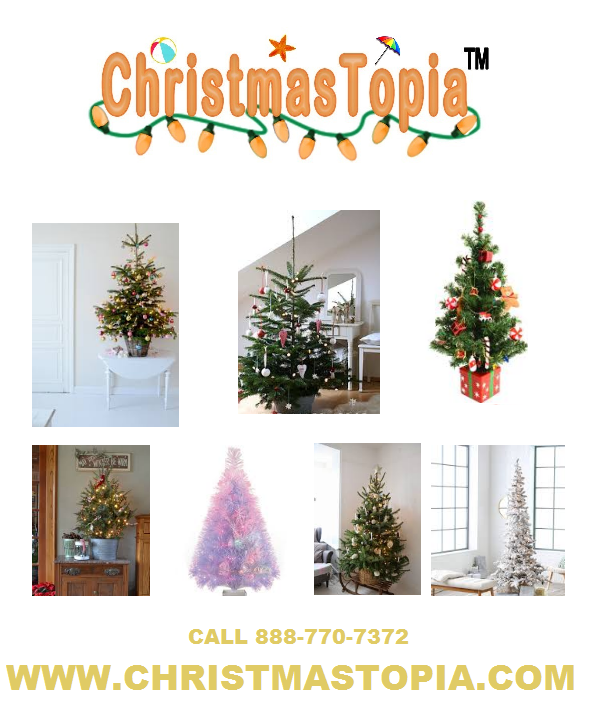 In these cases, we have cool looking wall trees to solve that problem.‎ Simply take the artificial Christmas tree out of the carton and hang it on the wall. Just like a picture. It looks fabulous! Additionally, allow me to show you the new potted prelighted artificial Christmas trees. You can put these trees in many different places. At home or at business. The potted Christmas tree will look fabulous when you pair them on two sides of an entrance.. You take these trees out of the box, fluff the branches out and that’s all you have to do. Instantly, you will have yourself a pristine looking lighted Christmas tree. So I guess the moral of the story goes, even with a limited amount of space, you can still decorate for the holiday season. LED string lights are not at all dangerous and they do not get hot. As an added bonus they also use next to zero electricity. Welcome to another edition of the Team Santa Inc. News Daily. Our mission is to bring you a steady stream of decorating news for the holidays all year round. While there are so many creative inspirations on the Internet. The picture above, I thought was very cool.‎ I downloaded the picture from Google Images. Anyway, the team that decorated this house absolutely knew what they were doing. Obviously, using the latest technology of LED Christmas lighting, the camera that took the photo experienced next to no glare. The photo is a real beauty. I guess that could be considered yet another advantage of LED Christmas lights, homes decorated in LED tend to look much nicer in photos. Not to mention the long term monetary savings associated with the low energy requirements. 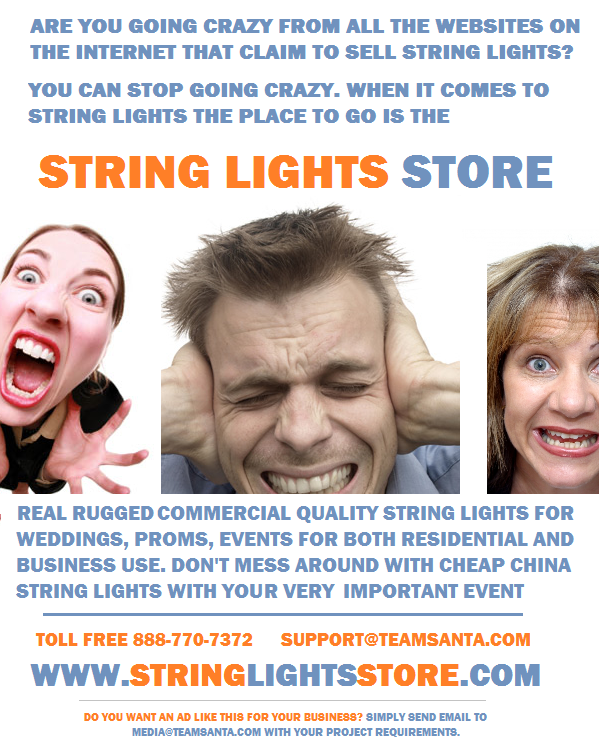 The average LED light string should last 3-5 years if the string is maintained appropriately. What I mean by that is the LED string lights should come down just as gently as they are installed. After Christmas, many of us want to take our decorations inside the house before the first significant snowfall. If you wait until the last minute, you will find yourself taking down your Christmas decorations much faster than you put them up. So try to remember and start early. Just keep in mind that if you are more careful when taking down your holiday lights and decorations, they will undoubtedly experience a longer life span. On the topic of long life spans, our prelighted artificial Christmas trees that use LED, the string lights are warrantied for approximately 5 years. After that, we can repair the strings on the tree for a nominal fee. All the new LED prelighted artificial Christmas trees have this warranty. So keep in mind that when it comes to decorating, try to be just as careful on the way down as you are on the way up. 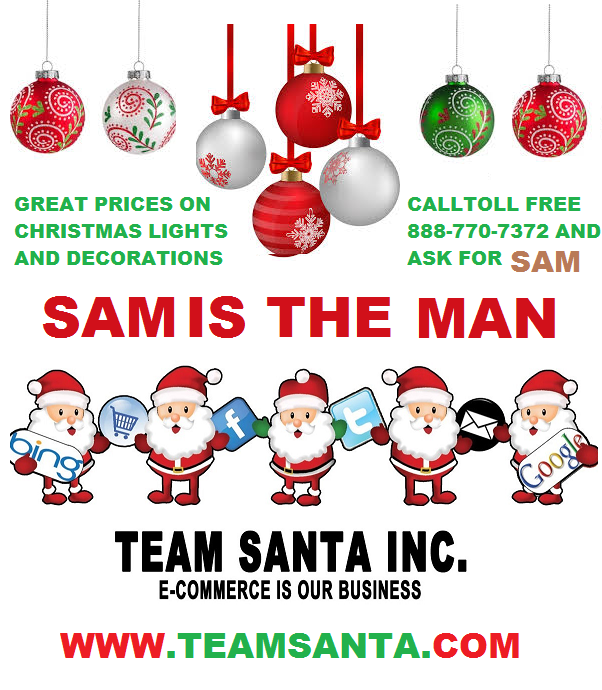 Team Santa Inc. has a product selection that is approaching 15,000 seasonal decorating products. The selection includes mostly Prelighted Christmas trees, and Lighted Outdoor Decorations. 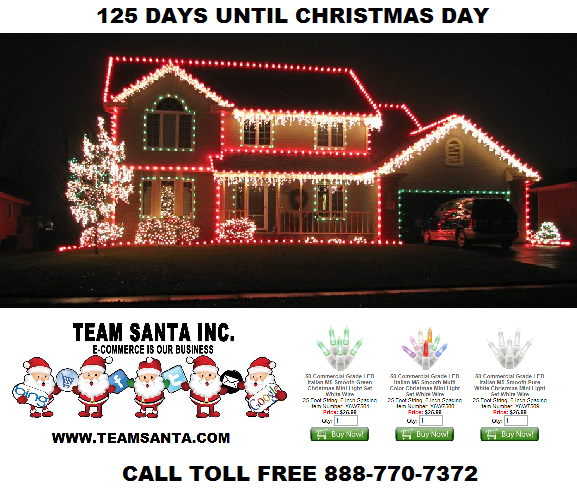 Team Santa Inc. is also an excellent source for your Christmas lights and Lighted Outdoor Decorations. You can trust that we will sharpen our pencils and work with you and your budget, to help make your fund raiser a huge success. 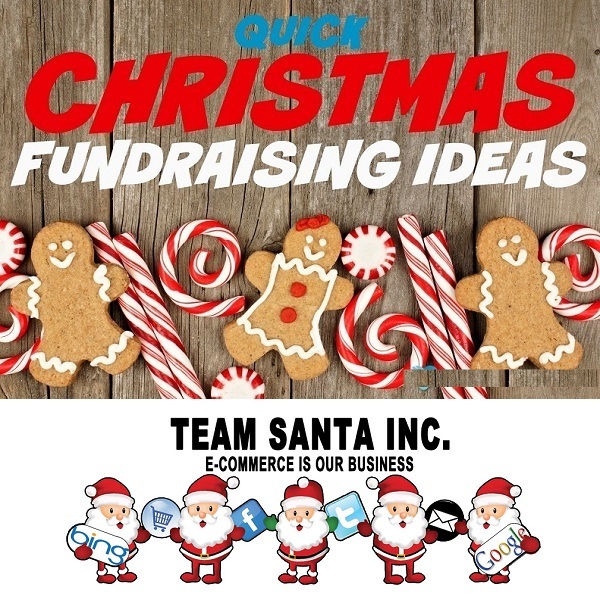 Team Santa Inc. simply just loves helping others make money! That’s all there is to it. Please give us an opportunity and we will provide you with the tools to make money with your holiday fundraiser. Team Santa Inc. guarantees it! ​Please feel free to send us your feedback to support@teamsanta.com. 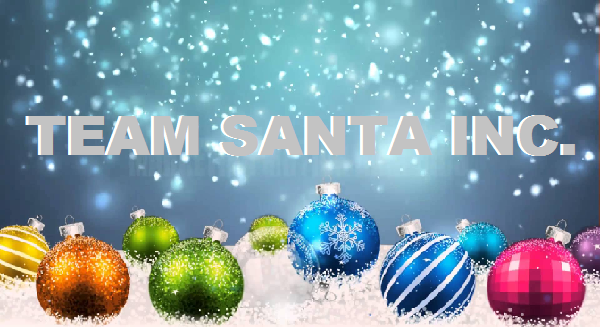 Thank you for visiting the Team Santa Inc. official website. 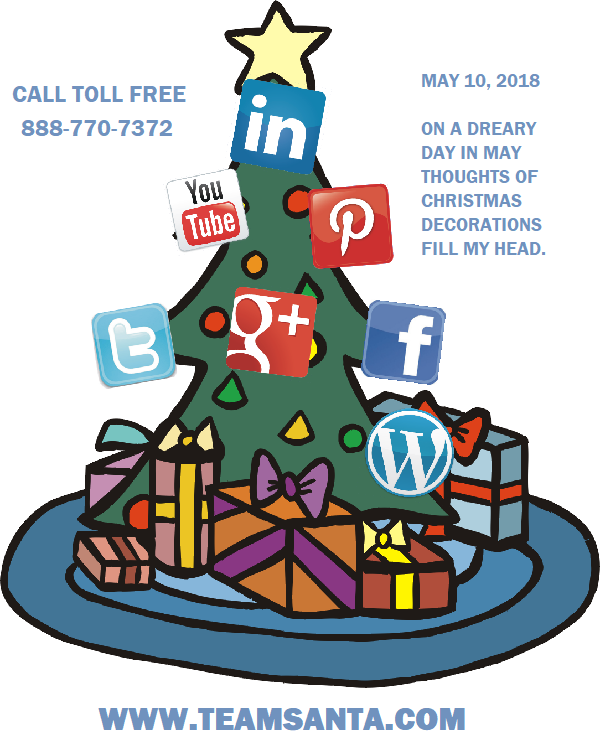 You can also follow either our Facebook page or our Twitter feed to stay up to date with social media topics or for news about some of the most awesome holiday decorations available for 2018. We provide updates every few days, so you can keep in touch and see what we are doing. Most people are not thinking about Christmas now, but when July arrives, that’s the six-month point where people start thinking about the holiday season. Our three catalogs have a combined 12,000 Holiday string lights and outdoor lighted decorations. In most cases we ship next day and offer FREE shipping on all orders $75 inside the continental United States. The current coupon code “socialmedia20” to get yourself a fast 20 percent discount on any product that we sell. All offers are only good while supplies last. Spend a few minutes just to look at some of the Christmas decorations for 2018. You are going to be amazed. We would sincerely appreciate you sending any feedback to support@teamsanta.com. The word “Christmas” brings a smile to everyone’s face. Whether you are an adult or child. It doesn’t matter. Just a finite thought of the holiday Christmas season puts most people in a better mood overall. Kids get all hyped up as we get closer to the holiday and tell us who doesn’t smile when they meet Santa Claus, no matter what time of year. There are so many things going on around the globe that are causing people to become terribly divided. More so than ever before. You see it everyday in the restaurants. Maybe while getting your hair cut at the salon. Definitely, when waiting at the doctors office. It’s always the same. 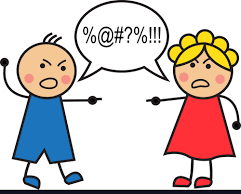 People will participate in spirited debate about current events taking place in our society. However, you mention the word “Christmas” to just about anyone and they are guaranteed to smile wide because the word “Christmas” brings those people happy thoughts which translates into joy. Sometimes I think that it would so be nice if the spirit of the holiday season existed all year round. Cafe String Lights are the newest lighting trend for restaurateurs, pub owners, bistro owners, etc. Today we are featuring LED S14 Cafe String Lights. S14 is the type of bulb that you see at outdoor celebrations and/or events like festivals, weddings, graduations, etc. The LED lights that we are showing you today, is a high tech variation from the traditional incandescent S14 string light bulbs. Important! If you already have an S14 light string and you just need bulbs, you can use either LED or the incandescent variety. Both bulbs types, although different technology have the same socket size and both will work on the same string. Prior experience with LED string lights has taught us that LED bulbs demonstrate way more energy efficiency and are much brighter and more colorful. Your electric bill will be lower too. Stringlightsstore.com has a selection of different S14 cafe string light bulbs available for all different types of professional quality string lighting projects. 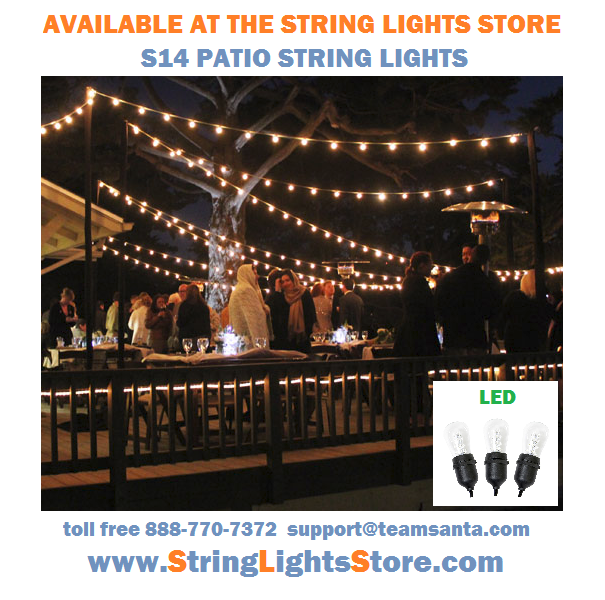 The light strings are built for indoor or outdoor operation. Other examples of LED S14 in use would be a carnival or perhaps the local church fair. You may see them in the used car lots too. They are usually strung about twenty feet in the air and provide wonderful overhead lighting. The S14 can be used in tents, congregation halls, restaurants, cafes, pubs and plenty more places too. Another benefit of using an LED bulb, over an incandescent bulb is that the LED bulb never gets hot, EVER! When comparing LED to their incandescent counterpart, LED bulbs ALWAYS stay cool to the touch. This way you can use them inside as well as outside with absolutely no safety concerns whatsoever. You can save $$ on these cafe string lights, just use coupon code “socialmedialsale20” (no quotes, lowercase letters) and save 20% off your order total plus FREE ground shipping via FEDEX. We look forward to seeing you again in a few days. Thank you for your support.